Located near the intersection of E Foothill Blvd and Redwood Ave, Extra Space Storage serves residents of Fontana, Kaiser, Rancho Cucamonga, and more! Locals will recognize our facility near the Fontana DMV a few minutes east of Almond Elementary School, McDonald's, and Jack in the Box. 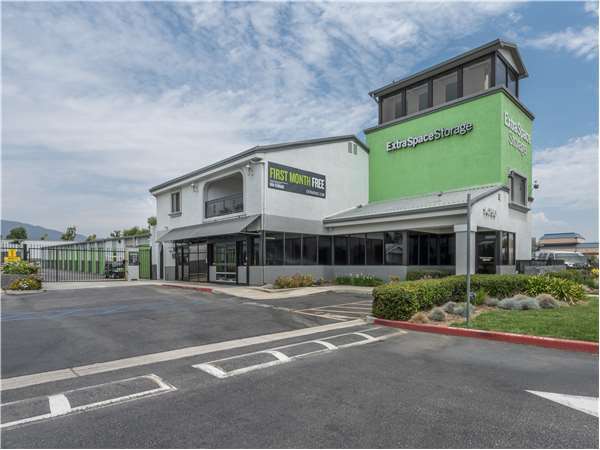 With a variety of storage units, climate-controlled storage, vehicle storage, and exceptional security, Extra Space Storage on E Foothill Blvd can handle residential and commercial storage needs in Fontana! Our E Foothill Blvd storage facility has units as small as 5x2 and as large as 12x40 with first-floor access, elevator access, and drive-up access. We have the space you're looking for! We're committed to your safety. That's why our Fontana storage facility has security measures like an on-site resident manager, 24-hour video surveillance, and electronic gate access. When storing temperature-sensitive items, climate-controlled storage is highly recommended. These units stay between 55 and 80° year-round, protecting your belongings from Fontana's heat. Climate-controlled units are available in sizes 5x5 to 10x5. Looking for vehicle storage in Fontana? Extra Space Storage has 7x15 to 10x50 covered parking spaces and 10x10 to 12x40 enclosed drive-up units that can handle vehicles from small motorcycles to large RVs. At Extra Space Storage, our friendly, professional team is committed to deliver exceptional service, and they will go above and beyond to ensure you get the best storage solution for your needs. Contact us today to reserve a storage unit in Fontana! I had a good experience, I walk in the door told them what i needed, show them a quote that I had already obtain online. They show me the unit and we sign the lease in less than 30 min. Joy was very helpful. When she didn't have the right size storage that I needed she called another Extra Space and let Azucena know I would be there soon. Azucena was great. Both were very helpful and friendly. Worst customer service ever. The staff there is incompetent, very rude especially the older lady that thinks is in charge. Glad i was able to call the district manager. Moving out real soon. Even if it was 50% off i would not return. Clean and safe storage space, easy access, organized procedures, fair price, kind and helpful staff. The location, staff, and clean indoor units were my deciding factors. Easily reserve online and access hours are perfect. Seamless process! Great service! The managers are well informed, professional and personable. The facility is very clean, well lighted, with easy access to units, as well as great gate hours. I recommend others to rent here, made moving less stressful! Fabulous place. It's a great place and the staff is awesome. Great personnel, friendly service, great hours for access to my storage unit. very secure facility! Friendly Guest Service on site and on the Welcome Message. Nice Place. This facility is very well kept, the staff is friendly, the prices are reasonable and the location is conveniently located between the 10 and 210 fwys. I would refer my friends and family if they would to ever be in need of a storage facility. The facility is conveniently located close to where I reside and the office staff is so helpful and delightful to deal with. Had a great experience at this location, great customer service. Mikayla was very helpful & George is a pleasure to do business with. I am so pleased to see that the place has greatly improved, clean and neat. Hope it stays that way. More impressive was the office management. Met both the Manager and his Assistant. Both were very professional and efficient and very pleasant to work with. The service is very friendly and they are extremely helpful in making sure you get what you need at a price you are comfortable with. Their security system is great. They keep an eye on it when you can't. Very helpful and answered every question I had. Clean and easy to get to. the staff/emp[loyees are always helpful,and courteous..
Great facility they always take good care of me, i will always refer to Extra Space Storage!!!! George here at Fontana was the most helpful. Made the rent easy and hassle free. Would recommend Extra Space to anyone I can find in need of a rental space. Great and solid company!! Steve was very accommodating to us when changing units. freindly and knowledgeable. Steve ahowed us the unit we had reserved online. The unit was very clean and very convenient to access. He made the paperwork easy and made our entire visit pleasant. I look forward to dealing with the staff here very much. Steve was very healpfull ,he responded to my needs, was very professional and provided great costomer service. So far the visit here was okay the staff was very friendly and helpfuf and nice. I was uipset when I came in due toa prior storage facility incident, and I was immediately turned around by the customer service, they heard my reasoning for me being upset, calmed me down and not only offered mt water but also a cheaper storage unit, same size as my (SOON TO BE OLD) storage unit. I am happy that I only had to drive down the street to this storage facility. Thanks George & Steve for the customer friendly inviroment and experience. to continue. Pleasant staff, easy enrollment activity. I am very satisfied with the service at extra space. The employees are courtious and helpful. the customer service has been a great help since the first phone i made. and they have been great at reminding me about my storage number because i tend to forget it alot. came in very stressed with my move..and service rep was more than helpful wit explaing the different storage sizes! I would most defitely share wit my clients and friends! thanks for everything!!!! Steve is a very accomodating and made customers feel welcome and relaxed. The place looks safe and clean. The service is perfect and can recommend to my friends for their storage needs. The Staff have been very Helpfull,secure place and new management very good., more time with late fees. The site was shown in a way that mae me want to rent the space rather than have to rent the space. I like the location and the fact that it appears to be very secure. Good customer service and cleaniness is the main reason why I chose this place. All others visited which was were just beat down business. Friendly service, helpful on what size of storage i would need. Clean building. i went to 3 other storage places before i came here and this place blew me away. Alfredo showed me the size and compared what the other guys were offerring me and even beat them on the prices. i got a bigger storage for less than what the other guys were offering. i was in a hurry, the man in the office was very helpfull. he showed me 2 different sizes. the process was very fast and easy. and he explained everything. Head south on the I-15 Fwy until you reach the Foothill Blvd exit. Turn left (east) and travel for approximately 2 miles. You will be passing Cherry Ave which is a main cross street. Once past Cherry Ave. proceed to the very next street which is Redwood Ave. After passing Redwood Ave, you will see the facility on the left hand side (north) of the street. You need to drive down to your next street which is Hemlock. Once at Hemlock, make a U-turn to drive back to the facility. Head north on the I-15 Fwy until you reach the Foothill Blvd exit. Turn right (east) and travel approximately 2 miles. You will be passing Cherry Ave. which is a main cross street. Once past Cherry Ave, proceed to the very next street which is Redwood Ave. After passing Redwood Ave, you will see the facility on the left hand side (north) of the street. You need to drive down to your next street which is Hemlock. Once at Hemlock, make a U-turn to drive back to the facility. Start by heading west on Foothill Blvd. Our location is approximately 1 mile east of Citrus Ave. Continue down Foothill Blvd. You will be going under an overpass and coming up to Hemlock. Once you pass Hemlock, our facility is located on your right (north) hand side, just before you reach the next cross street which is Redwood Ave.
Start by heading west on Foothill Blvd. Our facility is located east of the I-15 Fwy by approximately 2 miles. You will be driving past Cherry Ave. which is a major cross street. Once you pass Cherry Ave. the next street will be Redwood Ave. Once pass Redwood Ave. you will see our facility on the left (north) hand side of the street. You will need to drive down to the next street which is Hemlock. Once at Hemlock, make a U-turn and then proceed back to our facility.